This Whirlwind Medusa Multitrack 24 Channel XLR Male to XLR Female Snake Cable is constructed of multipair cable, with a heat-shrunk fanout at each end. 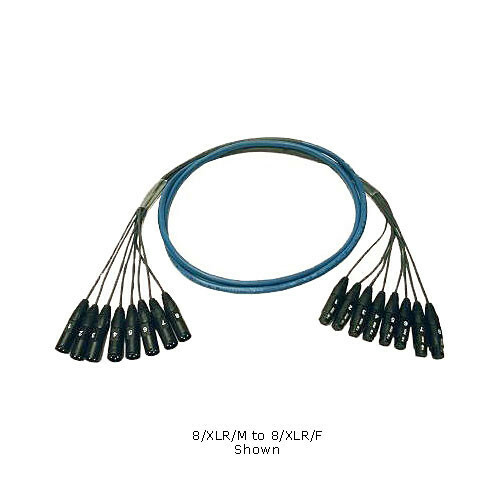 The cabling consists of heavy duty, flexible Belden CM rated multipair cable. Each pair contains two twisted 24GA 7x32 polyethylene insulated conductors with 100% foil shield and 24GA drain wire. The fanouts feature XLR connectors and all channels are numbered. Box Dimensions (LxWxH) 15.0 x 15.0 x 5.0"
Medusa Multitrack 24 Channel XLR Male to XLR Female Snake - 25' is rated 5.0 out of 5 by 1. Rated 5 out of 5 by David from Great, solid cable Super well-constructed cable. Very durable and to the task of getting great sound where it needs to go.